Violet Monroe has just fumbled her way through the first year of college. All she wants now is to go home and have one great summer with her best friends, Terran, the beautiful one, and Joey, the perpetually angry underachiever. But when she goes home, she finds that everything has changed: Joey's charismatic cousin, Brandon, has come to town, and pays more attention to plain girl Violet than she's used to. Terran and Joey meanwhile, decide to give in to their mutual attraction, only to deal with a troubling aftermath. In the midst of everything, Violet must decide who she is, something which her parents insist is intrinsically linked to what kind of job she gets after graduating. A contemporary coming of age story about the choices you make when you have no idea how it's all going to turn out. 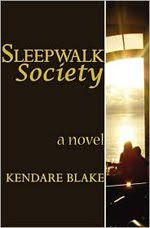 Sleepwalk Society by Kendare Blake was an extremely refreshing read. Blake was able to accomplish, in her debut novel, what many other, more experienced, writers are unable to - she created completely believable world and story. I cannot tell you how much I appreciate that she was courageous enough to write a book about young adults that teenagers could really connect with. Often times I feel that writers don't give teenagers enough credit and they produce watered down versions of reality. The world within Sleepwalk Society is not perfect; it is a gritty and confusing place - just like the world we live in. A lot of controversial issues and subjects arise within the plot - Blake is not afraid to push buttons, which allows for an honest portrayal of an 18 year old American girl. With Violet, she produces a character that could truly walk off the page. Everyone can identify with Violet, we all have a little bit of her within us. Her narrative is not always pretty, in fact it is often dark, confusing and unsettling. Her thoughts are not wrapped in a perfect presentable packing - but they are sincere and honest for her character. Violet is constantly struggling with what she is suppose to be in life. She suffers from a major identity crisis. She is aware of what other expect her to be, but she cannot determine who she wants her to be or what she wants out of life. One of the main causes for the push Violet feels to answer these questions, is her father. He gives Violet an ultimatum - she has to declare a major or she will not be returning to school in the fall. Not only does he want her to declare a major, he wants her to declare a respectable one. He instills the belief in Violet that what career a person chooses in life directly affects their worth. This just adds to the weight Violet feels from the decision and causes her to struggle even more. "I'm searching for the answer, any answer at all, be it the meaning of life, or the Holy Grail, or the Loch Ness Monster. Because at 18 I'm already behind schedule. We don't have time like we used to have time. I can feel mine burning away like the wax of a candle." I think everyone can identify with that. Especially today's youth. I know I certainly can. In today's world, you are expected to go to college and expected to have all the answers. You get your degree, then get a job and spend the rest of your life working to create a better life than what your parents had. But who says you have to go at such a break neck speed? Who says that this is what everyone wants? Not only was I able to identity with Violet's internal struggles, but I truly enjoyed her as a character. She reminded me of a female version of Holden Caufield - at least to an extent. Like I said before, Blake made Violet's narrative brutally honest - which sometimes makes her a little like Holden. She is of the world, but removed from it as well. She sees things differently, and often analyzes others (even those closest to her) from a distance. Her internal narrative is witty and honest - and always entertaining. However, Blake does a great job keeping Violet very human. She has a soft side; she wants to please people, which only makes herself more conflicted. There is a quote in the book about Violet, that I absolutely loved and identified with; "That's what I love about you, Violet. You're a cynic and a dreamer. Your a crowd of ten people who've fought to a standstill". Now, tell me this, who doesn't identify with that? As the story continues Violet also has the deal with the changing dynamic of her relationship with her two best friends, Joey and Terran. The two of them begin dating and it puts Violet on the back burner. She has a difficult time with this, because like I said, she doesn't really know herself. She has always defined herself as one of the points of the Joey-Terran-Violet triangle, and for the first time in her life, she has to become her own person. She soon meets and befriends Joey's cousin, Brandon and he sort of helps her examine what she wants out of life. He is also the only one in her life that expresses that it is alright to not know. I love the relationship between Brandon and Violet. It is never forced and like every other aspect in this novel, it is so utterly realistic. Brandon is not cast as the answer to all of Violet's problems and she does not become overly dependent on him - which I love. The book is highly character driven and all of the secondary characters are just as well written as Violet. There is not a single "stock" or flat character - everyone has the ability to surprise you. Blake did a marvelous job creating a novel that truly has the ability to speak to today's youth. Sleepwalk Society is a beautifully written coming of age story that really hits home. This could be a story about anyone - you, your neighbor or your best friend. This book puts into terms the pressure today's youth feels in a beautiful and captivating way. I would recommend this book to anyone and everyone. Do yourself a favor and go read it, right now! I love character driven books & coming-of-age, so this sounds like one for me. Great review. I'll check this one out for sure! Wow - I've never heard of this one and it sounds awesome! Thanks for the recommendations, and thanks for stopping by Book Love! I'm a new follower over here. And I love finding other bloggers from MI! I went to college at Hope!